In the pan of your bread machine, combine water, 1/4 cup melted butter, vanilla pudding, 1 cup warm milk, egg, 1 tablespoon sugar, salt, bread flour, and yeast. Set machine to Dough cycle; press Start. When Dough cycle has finished, turn dough out onto a lightly floured surface and roll into a 17x10 inch rectangle. Spread with 1/2 cup softened butter. In a small bowl, stir together brown sugar, cinnamon, and pecans. Sprinkle brown sugar mixture over dough. Butter a 9x13-inch baking pan. Roll up dough, beginning with long side. Slice into 16 one-inch slices; place in prepared pan. Let rolls rise in a warm place until doubled, about 45 minutes. Bake rolls in preheated oven until browned, 15 to 20 minutes. Stir together cream cheese, 1/4 cup softened butter, confectioners' sugar, vanilla extract, and 1 1/2 teaspoons milk. 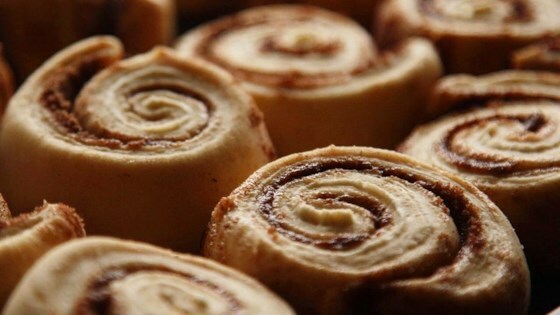 Remove rolls from oven and let cool until warm; spread frosting over warm rolls. I have made this recipe twice. I use raisins instead of nuts. I make them the night before , put them in the fridge and then set them out to rise and bake in the morning. Wonderful.